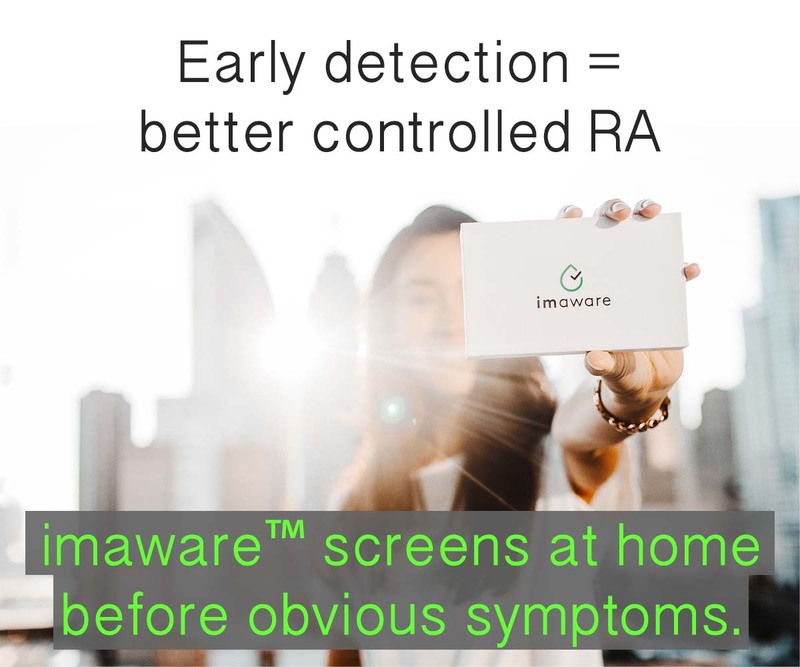 There are many ways to measure RA. Of course you’ve heard the pincushion jokes. But, blood work is the simplest way to get a picture of what Rheumatoid Arthritis is doing in a body. Sometimes x-rays or other scanning devices can detect damage. Actual disability is more difficult to appraise, though. Certain symptoms such as pain, stiffness, and weakness are tough to measure. However, they are important indicators of disease severity and progression. Over the years, doctors have developed several instruments to gauge the disability that Rheumatoid Arthritis causes. They include the Health Assessment Questionnaire (HAQ), the Keitel function test (KFT), and the Arthritis Impact Measurement Scale (AIMS). They attempt to record limitations in joint motion and difficulty performing certain tasks. The goal is to have a more objective way to measure, record, and predict ability to perform the daily tasks of life. 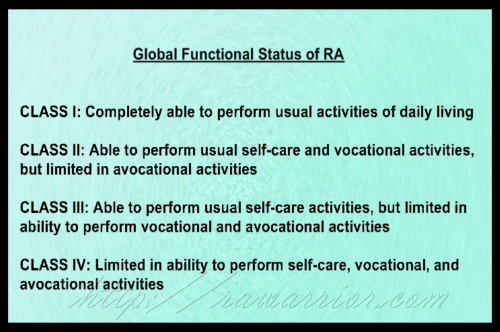 That is sometimes referred to as “Global functional status.” See image. Patients are classified according to their ability to perform activities related to these categories: self-care (bathing, dressing, grooming); vocational (job-related tasks); avocational (pleasure or hobby- related tasks). There are four labels based upon which types of tasks a patient can perform. Measuring functional capacity at the time of diagnosis of Rheumatoid Arthritis is important. It is a strong predictor for functional status later in the disease progression. The severity of the Rheumatoid Arthritis (as judged by functional status) is an even more accurate predictor of future disability than is the duration of the RA. Believe it or not, poor functional status is important in predicting long-term mortality in RA. I don’t point that out to scare you, but only to explain why researchers confirm how critical functional status assessment is to your treatment. It is vital to discuss your functional status with your doctors. It is an essential part of your care. We should carefully fill out any questionnaires that our doctors provide which ask for details about what kinds of tasks we can do and how difficult it is to perform them. We can also compare that to what we were able to do in the past (for example, one year ago or before we changed medications, etc). 2) Tasks which we can no longer perform. On a less serious note, this reminds me so much of those kindergarten report cards for little tasks: She needs help to tie her shoes; she feeds herself neatly; handwriting is barely legible; cleans up well, but needs encouragement. Let’s hope ours also says: shares and plays well with others. Does a blog make it better? 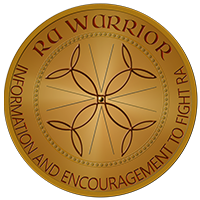 Mistaken beliefs about an RA blog? I am at 3, maybe 3 1/2. I never know how to answer when asked the 1-10 questions. If I answer too low, maybe they won't think I bad enough for attention, but if I answer too high I sound like a over the top complainer. I have an appointment Friday with my pain doctor. My knees are gone & need his advise. By the way, Dr. B gently explained how the combination of OA and RA work. In my case, the combination is about equal. I kept thinking about this little table of classification since I saw it yesterday. It seems to suggest that not being able to do fun stuff is less important than working. I disagree. Both do separate things, one gives you pleasure and with that hopefully the strength and energy to carry on, and the other brings money to the bank. Ofcourse, I live in Europe and have pretty good healthcare and normally don't have to worry about money if I can't work, so that may colour my idea about it. I think I got the same impression, that there is a kind of pyramid here. 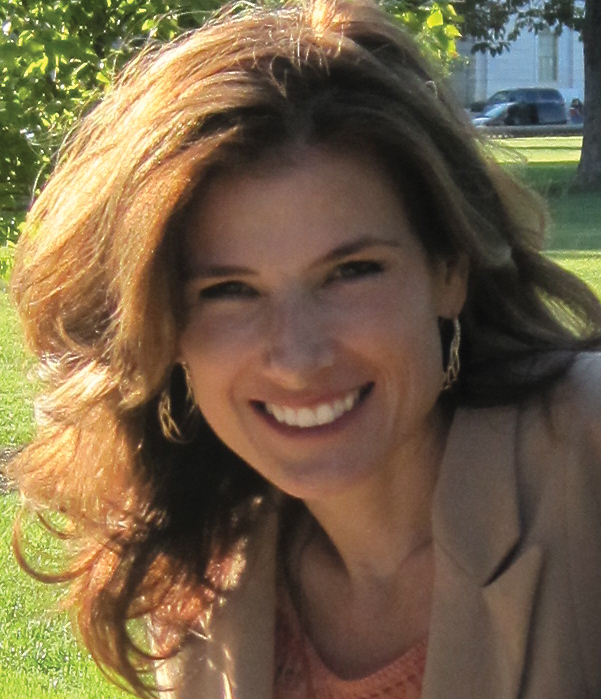 Taking care of yourself is first, then earning a living, then doing extra-cirricular. What you said is so true about mental health and physical health: we do need the avocational. That's why disability is so depressing. However, it might not just be money, because the Global Functional Status is used in many countries. Think of it this way: not being able to do your career or support yourself is even more depressing. Of course,we need to find ways to be useful in spite of disability; and this is hard, but possible. All lives are worth living! I am going to fill out the assessment and take it to my appt. with my rheumatologist tomorrow. He has never even asked about any of my functional capabilities. Jamie, That sounds like a good idea. Let me know how s/he responds. Some drs I’ve interviewed do ask these questions, but it does not seem to be as common as it ought to be. My pain level on any giving day is between a 7-8. I manage a restraurant I work 50 hours a week,at the end of my work week. I can barely walk or use my hands. It takes 2 days of lying on the sofa and lots of pain meds to even begin to ease the pain, not including the tiredness. I do not have the energy for anything else. If I do not work I can not pay for my RA meds. So I have to fight thru the pain and work.